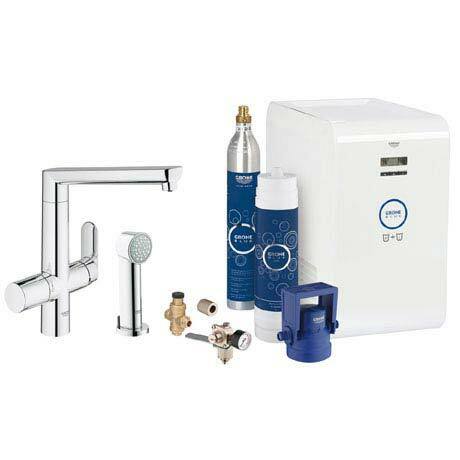 The Grohe Blue Chilled & Sparkling Starter Kit turns ordinary tap water into pure, soft table water that is perfectly safe to drink and has a wonderful taste optimized by the smart filter technology. Whether you want still, medium or sparkling water, simply turn the handle to select your preferred choice. As well as pure filtered water the tap also delivers ordinary tap water like a conventional sink mixer while its high, smooth swiveling spout makes filling large pots easy. The side spray offers full flexibility and a powerful flow for any cleaning tasks in and around the basin.